I was in a "wheelie-wheelie" cranky mood today. Here are somethings that interested me. 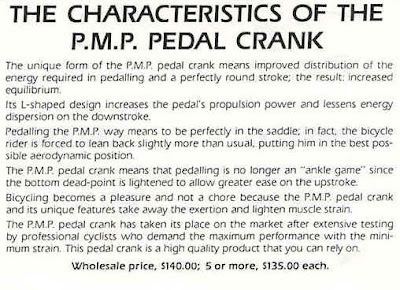 PMP's new cranks are certainly unique. The external bearings, oversized axle and hollowed-out backs of each arm are not far out of the mainstream, but using a square taper on the end of the spindle in this day and age is eyebrow-raising. PMP has re-invented the square taper, however. Besides being much larger, the square axle end is split at the four corners. The chamfered head of the bolt expands the end of the square end of the spindle to bind more effectively with the crankarm. Is PMP missing an "i" and an "ed"? You might wonder who in the world PMP is. 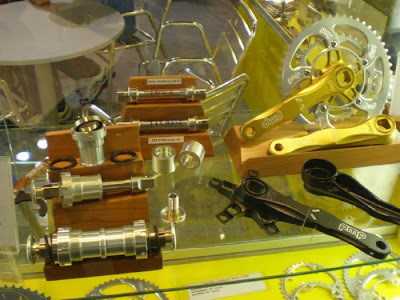 History has it that PMP was among the first (I'm not sure who the others were) to make non-straight 'Z' type cranksets. I certainly haven't seen these myself. Your grandfather might have. 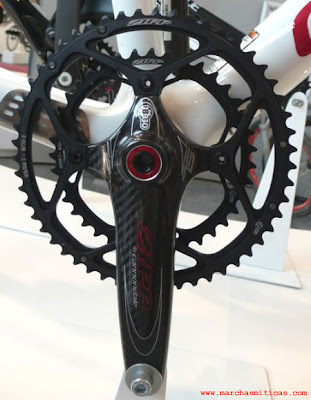 After ZIPP, FULCRUM has invested their energies in a crankset of their own. Its interesting to see many bicycle companies are extending their product line to be competitive in the road market. FSA has stepped up their game. Their new BB30 threadless system features oversized bearings pressed back into the frame, and an exceptionally low Q factor. Their design will have companies scrambling to make frames that will accept the BB30 "standard". Watch out for more of these in May 2008. In an earlier post, I wrote about these new sets of toys, interesting to any power hungry rider. 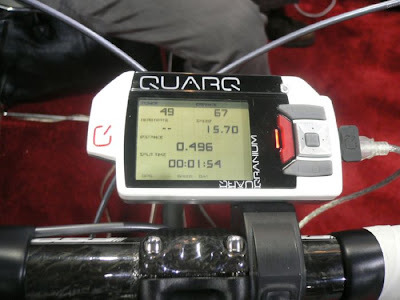 Now we have a price for Quarq Cinqo (a mangled version of "Quark", from particle Physics). 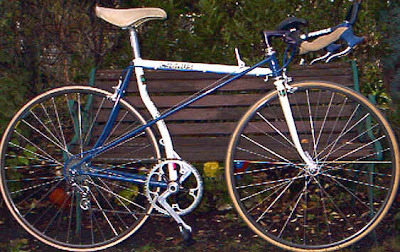 $1195 is the word, without the power meter computer, that is an additional $995. But fear not. News is out that this ANT+SPORT system is compatible with the Garmin 705 Edge computer. That's about 500 dollars a piece. As much as I like the CINQO design, I would be somewhat concerned about creak from the 2 piece spider crankset type design. Ideally, I would like to have 1 piece everything. But the convenience this design offers from other type of cranksets is pretty good. With PT, you have to switch wheels. 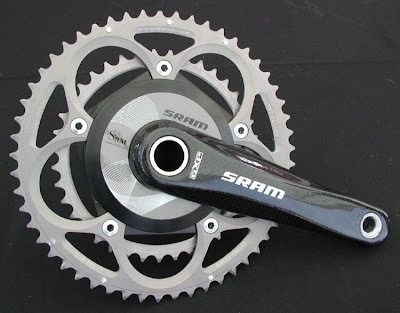 With SRM, you have to swtich entire cranksets. 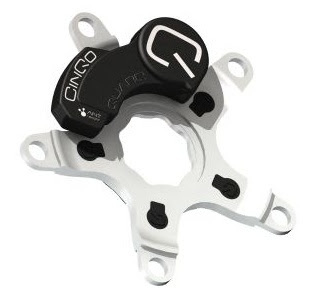 The fact that Quarq has narrowed it down to a crank spider is very innovative. ZIPP has a love affair with high priced componentry. This one is for the King of England, with possibly the lower Q factor in the market! The VumaQuad is built with a 110mm bolt circle diameter. 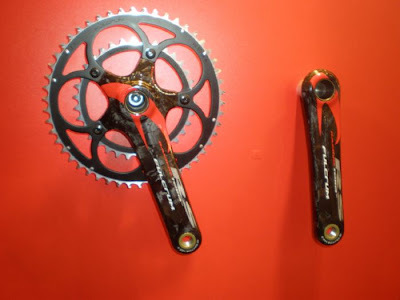 Most of the competition forces you to choose between a "standard" 130mm bcd and a "compact" 110bcd, and then sells chainrings based on each design. Zipp simplifies everything by going to 110mm and designing chainrings that work in the popular compact sizes and popular standard sizes. Zipp has both. 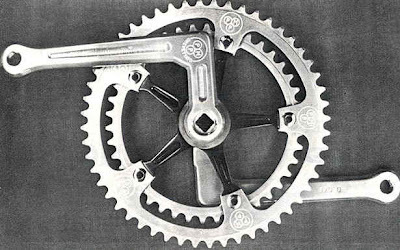 There are those who will be concerned that a 53-tooth chainring paired with a 110bcd crank will flex. It's a concern, one we shared with Zipp. Zipp has tested their 53 against the competition and found their design is at least 14% stiffer than any five-arm 130bcd crank on the market. 14% stiffer. Ok, I won't jump until I see some technical data. 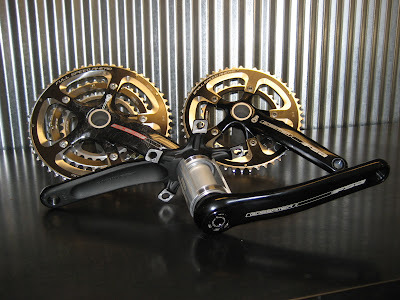 The VumaQuad takes compact crank design and performance to another level. At 560g it is the lightest stiffest and strongest carbon crank on the market. Passing the new, far stricter CEN fatigue test while many other brands were grandfathered in. FYI, CEN is the European Committee for Standardization. Has ZIPP stopped doing business with EFBe or not? While many are raving about SRAM red, I'm raving about its SRM power meter system. Beautiful! 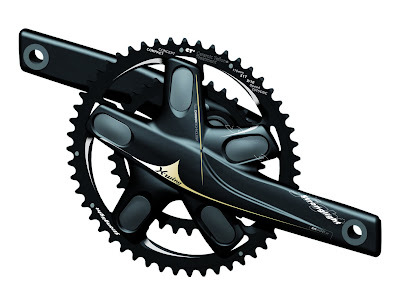 Flying over to France, famed crankset maker Stronglight has come out with a new "X-Wing" crankset lineup for 2008. First of all, this design looks great like all other Stronglight cranks, but their assembly of crankarm to chainring seems to be in a whole new dimension. No real pictures out yet, just concept diagrams. And guess what, they have jumped on the BB30 bandwagon as well. Diagrams show how the bearings are pressed into the frame. Other than this, I'm happy to be back in Buffalo after almost 24 hours traveling from Dubai. From Burj Dubai to the premises of the desolate UB Campus... Hmm, not really excited but atleast I'm back on the bike doing Base training, and wrapping up my course work to get the heck out of here. With the wireless Powertap all you gotta do is switch the wheel to another bike, put 2 zip ties on the computer and you're good to go...it doesn't get much easier than that to swap a PM. Ron... that PMP crank is just wacky... It makes me a little loopy just looking at it.